Last Updated: February 9, 2018 | Subscribe to our weekly newsletter! Buying a hot tub cover is an investment, not only due to the price of a high-quality model, but because using a cover is so important to the lifespan of your spa. But after you’ve got the perfect spa cover, you may find yourself using your hot tub a little less frequently. And then maybe you start to procrastinate on cleaning or testing your water as often as you should. It could be that lugging the 50- to 75-pound, bulky, awkward spa cover around by hand is a bit less convenient than you anticipated. Maybe it’s time to do yourself—and your back—a favor and invest in a hot tub cover lifter. 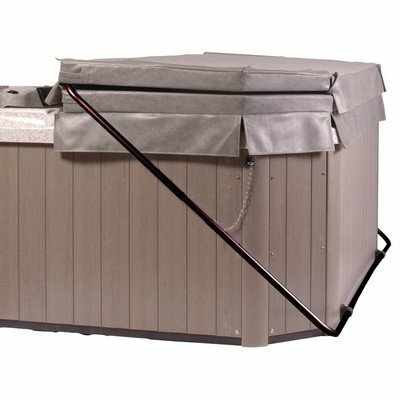 Why Buy a Hot Tub Cover Lifter? Sure, you could probably manage moving a brand-new hot tub cover by hand. They’re only about as heavy as a large bag of dog food. But it’s not just about the weight. The size and shape of your hot tub cover can make it difficult, or at least awkward to remove and stow without someone to help you. Bending and lifting large, heavy things can put your back at serious risk of injury. If you want don’t want to call for backup every time you need to remove or replace the cover, a hot tub cover lifter is just what you need. Even the simplest models enable you to uncover and cover your spa on your own with little effort. Over time, even with the best vapor barrier money can buy, your cover will start to absorb water that evaporates from your spa. Over time, your cover’s weight will start to creep upward as it retains more water. When your cover is irreparably waterlogged, you’ll need to replace it, but until then, a little mechanical help in moving it will make your life easier. Using a hot tub cover lifter is like having an extra pair of hands to help you open your hot tub. Making this task easier means you can pop your spa open for quick water chemistry checks, easy hot tub cover cleaning, and solo soaks without hurting yourself. You won’t find a mind-boggling variety to choose from, but it helps to know the three standard styles of lifters, how they work, and how they help you care for your spa. 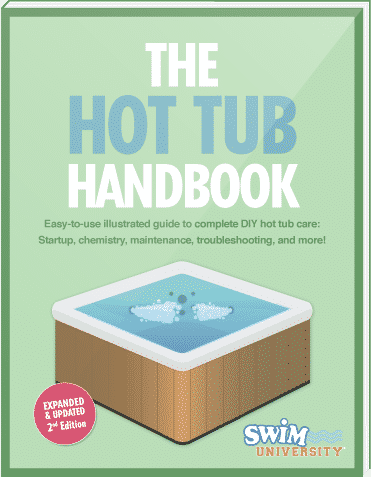 Want a simple, cost-effective way to manage your hot tub cover? This is it. It’s a shelf that mounts on the back or side of your spa. We did say simple, right? All you’ll need to do is fold your cover then slide it onto the shelf. Some feature rollers that make it even easier to push your cover onto the shelf. 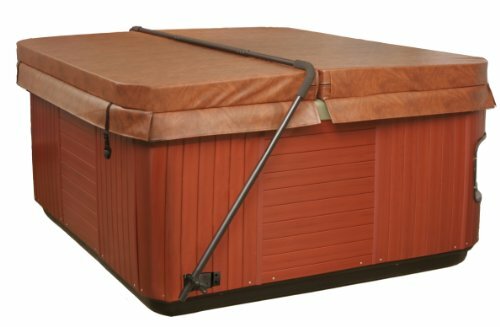 Most shelf hot tub cover lifters take up quite a bit of space, so make sure you have the clearance available next to your spa to fit it. Some models fold down when not in use, which may be nice if your shelf will make your spa area a tighter squeeze. Shelf cover lifters don’t do any of the actual weight-bearing work of removing your cover. They just make it less difficult than fully removing and stowing the cover somewhere. If you struggle with the weight of your spa cover, a shelf cover lifter is probably not the best option for you. If you’re on a budget, but you need some help with actually lifting your hot tub cover, consider a manual pivot cover lifter. It works similarly to the way you slip a pair of slacks over a hanger. A long, metal bar fits across the middle of your spa cover. Each end of the bar is mounted to your spa on a bracket that pivots. You’ll fold your cover in half (with the bar secured in the middle), then lift it upwards and push back. It will hang on the bar vertically, just like slacks on a hanger, until you pull it back into place. 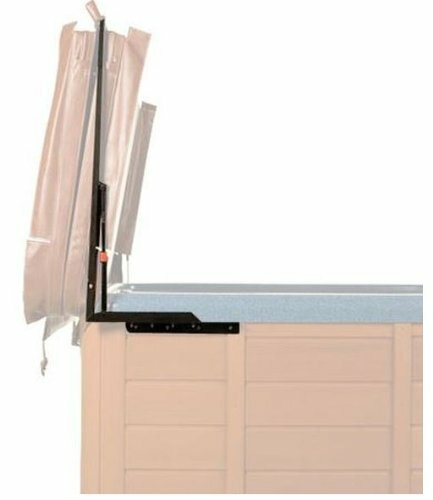 The downside of this style of spa cover lifter is when your cover is off the hot tub, it will stick up past the top of the hot tub, blocking your view on that side. If you choose this style, choose where to install it with that pitfall in mind. The most helpful option is also the most expensive, but with good reason. This type uses hydraulic pistons incorporated into the arms of the lifter to carry all the weight of your cover for you. The way you use it is nearly identical to the manual pivot lifter. You install brackets on your spa cabinet, then attach an arm that will lie across the middle of your cover. You’ll fold the cover back, then guide it up and back, allowing the hydraulic arms to bear the weight of the cover. You’ll likely be able to operate this lifter one-handed. While most models have the same drawback of obstructing one side, you’ll find a few hydraulic hot tub cover lifters on the market that preserve your 360-degree view by bringing your cover down to ground level for storage. Given the three styles available, exact instructions for installing your cover lifter will be determined by which type and specific model you buy. However, the main points are nearly universal. This is the easiest lifter to install, and requires just a few tools you probably already have available. Measure and mark the places you’ll need to drill on your spa cabinet. You’ll have at least four screw holes to make, two for each bracket. Follow the manufacturer’s recommendations for proper placement. Carefully drill guide holes so you won’t crack your cabinet. Install the mounting brackets using a screwdriver and the included bracket hardware. Insert each shelf arm securely into a bracket. Check that the arms can be folded in or down as they should per the manufacturer’s instructions, and that they support your cover properly. You may have an easier time with this one if you can get someone to help you. Wrangling that bar and the slider arms by yourself can be challenging. Place your cover on your hot tub, making sure the corners are properly aligned. Measure, mark, and drill guide holes for the brackets per the manufacturer’s specifications. Attach the slider arm and pivot arm to each other per the product instructions. Place your slider arm into the bracket. Lay the long, center bar across your cover. Insert each end into the curved support arms. Insert the support arms into the pivot arms. Fasten all the sections according to the product instructions. Check that everything works properly, and adjust as needed before finishing up. An extra pair of hands is definitely helpful for this one. In fact, you may even find that hiring a pro to install it is the easiest way to go since this one involves an electronic mechanism. Measure, mark, and drill guide holes, then install your brackets. If you’ve chosen a hydraulic lifter that doesn’t require you to drill into your spa cabinet, you’ll assemble the base and frame first. Lay the long, center pole across your cover. Insert each end into the support arms. Insert the support arms into the pivot arms, then secure them into the brackets. Install the hydraulic arms per the manufacturer’s recommendations. This step can require maneuvering the assembly, so this is where you’ll probably need someone to help you. Check that your lifter is working as expected, troubleshooting bracket placement if necessary. Because they’re manufactured to be used in hot, steamy environments around water and chemicals, cover lifters are typically made from stainless steel or composite materials. Their components resist corrosion and are simple to care for. Just keep your eye out for a few potential issues, and you can enjoy your cover lifter for years. Whenever you use your spa cover lifter, watch the arms to see whether they’re bending under the weight of your cover. If you’ve got a shelf lifter, be sure you inspect the arms occasionally. As your cover becomes waterlogged over time, it will place undue strain on your lifter. You’ll need to replace your cover (or at least the foam core) when this happens, but if you allow it to damage your lifter, you’ll end up repairing or replacing that, too. This is part of why proper cover care is so important. When it’s time to drain and clean your hot tub–every three to four months–be sure to inspect all the components of your hot tub cover lifter. Grab a screwdriver or socket wrench and tighten up brackets and hinges, if needed. No matter what type of hot tub cover lifter you choose, you’ll need to keep it clean to keep it in good working order. There’s no need for any special type of cleaner. Just a mild multi-purpose cleaner on a soft cloth is enough to give the arms a wipe down to remove grit or debris that could inhibit their movement. If moving parts are squeaking, a little spray of water-resistant silicone lubricant should eliminate the problem. Protect your spa cabinet and shell from overspray by holding a cloth under any part you spray. If you’ve got a small budget and you’re handy, you might want to try building your own cover lifter. You can build one using electrical metal tubing (EMT) conduit, elbows or a bender, conduit straps, nylon webbing, and screws. You’ll only need basic tools: hacksaw, level, drill, and screwdriver. Note: You’ll find some online plans use polyvinyl chloride (PVC) instead of EMT, but we advise against that choice. Sunlight and heat can weaken PVC, warping it or potentially damaging your hot tub cover. Are you just not the build-it-yourself type? Too busy to take on another project? No worries. We’ve handpicked the best cover lifters across all price points, so you can buy the perfect one for your spa without blowing your budget. Our lowest priced pick improves upon the basic cover shelf by adding wheels. Each arm has four rollers on top. 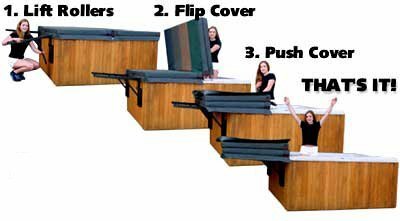 When you fold your cover and push it over onto the arms, the rollers minimize resistance so it’s easier to move you cover. When not in use, the arms fold down flat against the side of your hot tub cabinet. This model says you only need a screwdriver to install, but we recommend you use a drill to make pilot holes in your hot tub cabinet before installing screws to avoid damaging your cabinet. 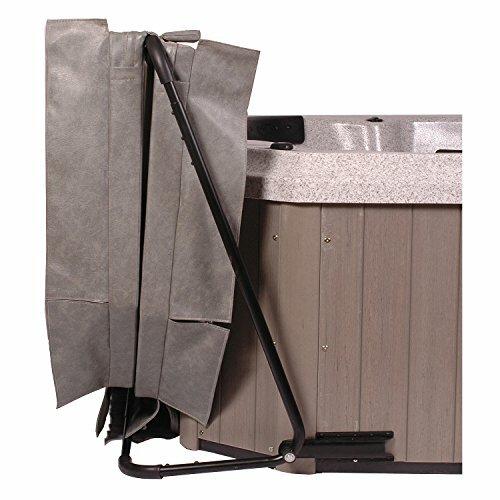 Another affordable and simple cover lifter, this manual pivot style mounts at ground level so your cover will fold down behind your hot tub, preserving the full view around your spa. It’s made from corrosion-resistant, powder-coated steel, so rust won’t be a problem. However, this model isn’t for everyone, or every spa. It’s designed for use with square or rectangular hot tubs up to eight feet with radius corners. The brackets won’t install properly on spas without rounded corners. You’ll also need about four feet of clearance on the side you want to store your cover so you have enough space to fold it back and down. If your spa fits within its limitations, it can make removing and stowing your cover a one-person job. Similar to the Blue Wave Low Mount, this version also features heavy-duty springs that help bear the weight of your cover as you use the lifter. The poles can be adjusted for different size spas. The best part is, you won’t need to drill any holes or drive any screws into your hot tub cabinet to install this manual pivot cover lifter. It has feet that slip under your spa, using the weight of your hot tub to keep it in place. As such, it’s much easier to install this lifter when your hot tub is empty. This lifter is basically a powder-coated aluminum rectangle that attaches to the bottom, back side of your spa. It needs only 18 inches of clearance to work, so it’s a great solution if you’re on a budget but you don’t have a few feet to spare around your hot tub. While it will impede your view a bit, only part of your cover will stick up past the side of the spa. 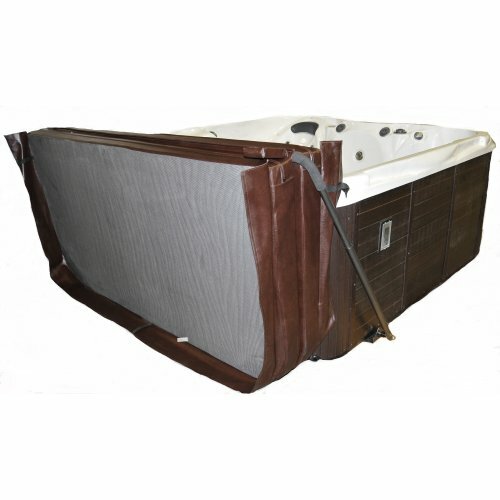 This model is designed specifically for square or rectangular hot tubs up to 96 inches wide, and it will not work properly with sunken or inground hot tubs. It’s not the fanciest cover lifter we’ve ever seen, but it gets the job done. Installation is simple. It features dual gas springs which make opening and closing less strenuous. Once you have it up, you can lock the cover lifter into place so it can’t fall back onto your spa. If you want a full view around your hot tub, this isn’t the one for you, as it will block one side of the hot tub completely. Still, if you’re looking for a lifter that is reliable and safe, this one is tough to beat. This durable powder-coated steel model can withstand harsh outdoor environments. It’s pretty easy to install, mounting directly to the bottom sides of your spa. It only requires one foot of clearance, but won’t work with recessed hot tubs. Instead of hydraulics, this model uses a lower bar you press with your foot to help offset the weight you need to lift with your arms. 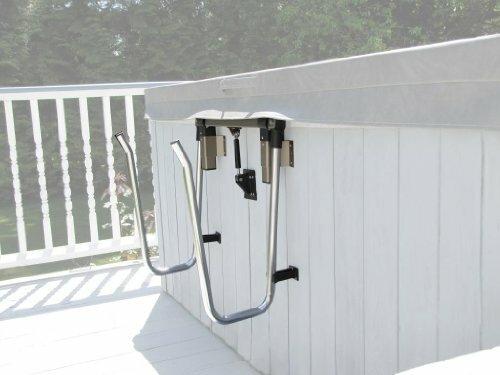 If you have a bad back, you may not be able to comfortably maneuver this style of hot tub cover lifter. You’ll need a little extra room (about two feet) behind your spa for this one, but its unique design makes removing your hot tub cover a breeze. Plus, you can use it on almost any style of hot tub, except round. The bars are curved to provide ample room for covers up to five inches thick. You’ll use it in a similar way to using a shelf lift, by folding your spa and sliding it over into the curved arms. Then a small hydraulic arm assists you in folding the cover down to the side of the spa (and in lifting it back up again when you’re ready). The only drawback to this cover lifter is it doesn’t fold completely flat when not in use, and your view will be partially blocked when your cover is stowed. Installing a hot tub cover lifter will make removing your cover faster and easier. Keeping it clean will be a bit less work. Making sure your spa cover is back on after a nice, long soak won’t be such an arduous task, either. Trust us. Once you start using a hot tub cover lifter, you’ll wonder how you ever lived without one. A high-quality hot tub cover is a big and important investment. Buy the right one, and then maintain it properly, and it'll keep your spa happy for years.